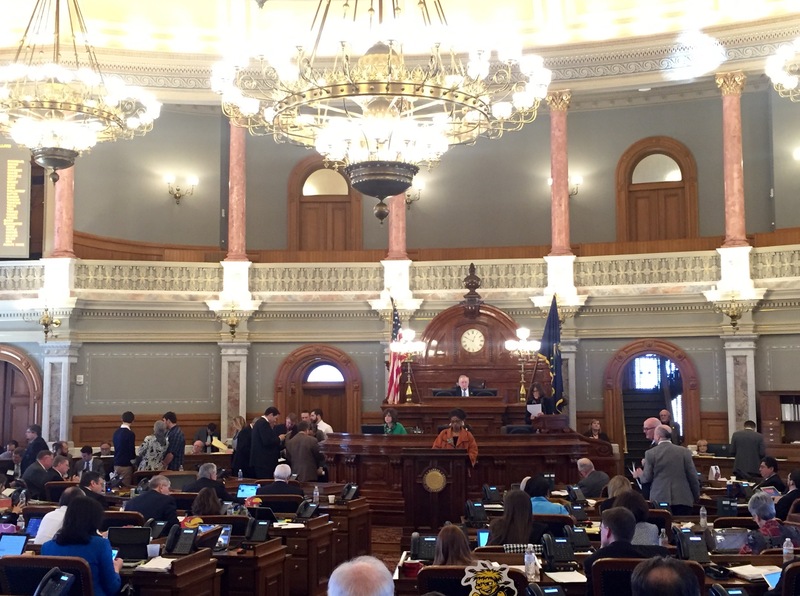 Kansas lawmakers advanced legislation that would create new school safety plans and curriculums. The state House of Representatives advanced a bill that would have the state Board of Education work with school districts to create new school safety plans, along with creating a new firearms safety curriculum that local school districts could put in place. The debate centered along a series of issues including the National Rifle Association and whether teachers should be armed. The debate and vote came after a House Insurance Committee hearing on a bill that would expand armed teachers in schools. Much of the debate centered on an unsucccessful amendment from Rep. Stephanie Clayton (R-Overland Park) that would have removed language in the bill that would have set the NRA’s Eddie Eagle gun safety education program as a potential curriculum. The bill’s language references the Eddie Eagle program along with “other evidence based programs.” Clayton’s amendment would have removed the NRA specific language, which she said would allow the state and school districts to have their own program, or use the NRA curriculum. The bill also references a hunter safety education program run by the state Department of Wildlife, Parks and Tourism as a potential curriculum for high school students. Clayton’s amendment touched off a debate in the House centered largely on the NRA with supporters of the Eddie Eagle program saying that the program is strictly about gun safety and opponents saying that the American public wants to reject the gun lobbyist. Rep. John Whitmer (R-Wichita), who helped write the bill, said that the language makes the Eddie Eagle program just one option and noted that the bill’s language for “other evidence based programs” was a compromise and helped bring the Kansas Association of School Boards on board with the bill. He noted that the Eddie Eagle program has been successful in teaching children not to touch a gun and what to do if they see an unsecured gun. Rep. Boog Highberger (D-Lawrence) said that Clayton’s amendment would not stop the Eddie Eagle program from being put into place, he said it would just take the reference to the NRA out of the bill. He noted that he does not believe legislation should cite specific groups. Highberger said that individuals believe that the program is to push the NRA. “It radicalizes the NRA’s gun agenda of putting guns everywhere in America,” Highberger said. Several lawmakers said that the Eddie Eagle program does not have NRA branding and was not created by the NRA. Rep. Cindy Holscher (D-Olathe) took to the floor to tell lawmakers that last weekend’s March for our Lives shows that people, specifically teenagers, are not in support of the NRA and that those voices should be heard. She said 7,000 people attended the march in Kansas City over the weekend. 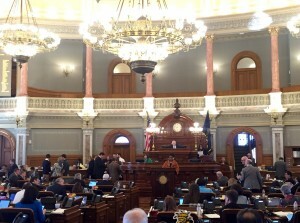 “Across the nation and in Kansas they are rejecting the NRA,” Holscher said. Holscher said that people she talks to see the Eddie Eagle program as an NRA marketing tool and that while it is not mandated if it is in the bill, school districts may feel compelled to use it. She also told her colleagues that instead of being concerned with the thoughts of the NRA they should be focus on teenagers who will communicate with each on who is best to vote for in the next election. “You should be worried about teens with cell phones,” she said. Whitmer asked his colleagues to focus on more than attacking the gun lobby. “Let’s stop picking on the NRA,” he said. Clayton said that she was presenting her amendment in an effort to remove “drama” from the bill. Rep. Kristey Williams (R-Augusta) stressed that the bill did not mandate the program. Lawmakers also rejected an amendment from Rep. Brett Parker (D-Overland Park) that would have banned teachers from carrying concealed weapons in schools. Parker, a teacher said that teachers are concerned about the ability to carry and worried about a bill that is pending in the House Insurance Committee that would expand armed teachers. Parker said that he has gotten many emails in the past week about the issue of armed teachers and that they are in opposition to the idea. He noted the opponents who testified earlier Tuesday during the insurance panel’s hearing. Williams, a former teacher, said that Parker’s amendment would take the decision of armed teachers away from local school districts and place it in the hands of the state government. She said she would prefer the school districts to make those decisions. “If a local school district reviews a particular situation and a particular teacher and allows them to conceal carry, we should allow them,” she said. House Minority Leader Jim Ward (D-Wichita) questioned whether teachers could receive the proper training to react in the event of a school shooting. He noted that President Ronald Reagan and three others were shot during a 1981 assassination attempt while the Secret Service were surrounding Reagan and did not shoot back at John Hinckley. Hinckley was quickly tackled by the Secret Service. Rep. Blake Carpenter (R-Derby) told his colleagues that arming teachers would be one way to increase safety in schools. “I will not sit idly by as our kids, teachers, custodians and groundskeepers are being gunned down by mad men,” he said.